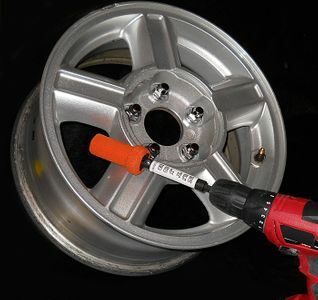 Nutt Job Wheel Cleaning Tools were the result of a better way to clean different size lug nuts on a wide variety of vehicles. Randy "Crusher" Lewis, a fabricator in Pro Racing was the right man for the job. 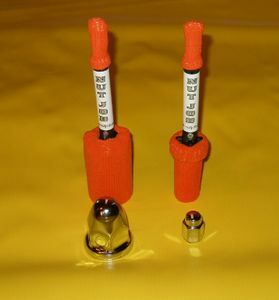 Nut Job Tools are targeted to tackle not only lug nuts, but also surrounding areas of the wheel on cars, trucks, motor homes and semi's. 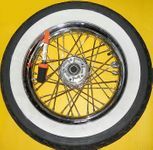 You can also count on the tools to clean and polish spokes, so motorbikes and bicycles are a breeze! Boats should also be included. Narrow railing and other chrome or brass adornment can be difficult without this remarkable tool. The Nut Job is so versatile, it can be used around the house. Nothing is better for polishing door knobs, light fixtures, metal railing, plumbing fixtures, andirons, etc. The "cleaning sock" material is made of a super, strong material that expands & contracts. 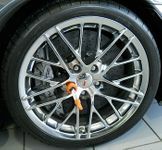 This creates a tool that can self adjust to various wheel areas. The socks are manufactured in the U.S., are machine washable, and may be replaced. Durability was thoroughly tested before production. A detail shop at an auto dealership was used for this purpose. 1,200 vehicles were cleaned with NO breakage, problems or adjustments to the NUT JOB! The manager of the dealership reports that time spent cleaning the wheels was dramatically reduced and the quality of work, greatly improved! Other lug nut cleaning tools fall short of our Nutt Job. They can only be applied by hand, and utilize either a short-lived foam tip or a damaging, metal wire with stiff bristles! The flexible, cleaning sock may be used to polish additional areas of a wheel. Use you favorite polish on rims, slots, forks, spokes and valve stems. Professionals find the variety of Nut Job accessories greatly increase the speed & efficiency of polishing, so the average auto enthusiast will find them AMAZING! The NUT JOB allows You to accomplish dreaded tasks simply and efficiently. The Nut Job is made of a special material that makes it flexible in the jaws and still incredibly durable! Click on link to view the Nutt Job's Design. The NUT JOB is produced entirely in the USA and assembled at Frontier Industries (a handi-cap school) in Tennessee.